When trying to print floating point numbers of type float using sprintf() or printf() functions in an AVR 8-bit C program using Atmel Studio 7, the number does not print correctly. Instead of the float being printed to a string or standard output, a question mark is printed. The reason that floating point numbers are not printed is because the default settings in Atmel Studio disable them for sprintf / printf type functions to save microcontroller memory. The solution to this problem is to change some linker settings so that the floating point number is printed as expected. After building a simple C program in Atmel Studio 7 that uses sprintf() to print a floating point number to a string and send it out of the serial port (USART0) of an ATmega2560 microcontroller, the following memory usage was recorded. Where 1) above is before changing linker settings to enable printing of floating point numbers (output printed to string is: flt_num = ? ); and 2) is after changing the linker options as described below (output printed to string is: flt_num = 31.8394). The test code used is shown in the following listing. In Atmel Studio 7 on the top menu, click Project → <project name> Properties... to bring up the properties page for the currently open project. 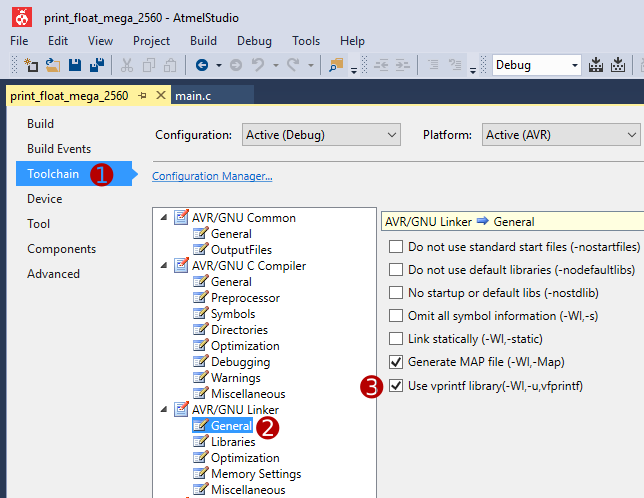 The image below shows the menu in Atmel Studio 7 for a project named print_float_mega_2560. 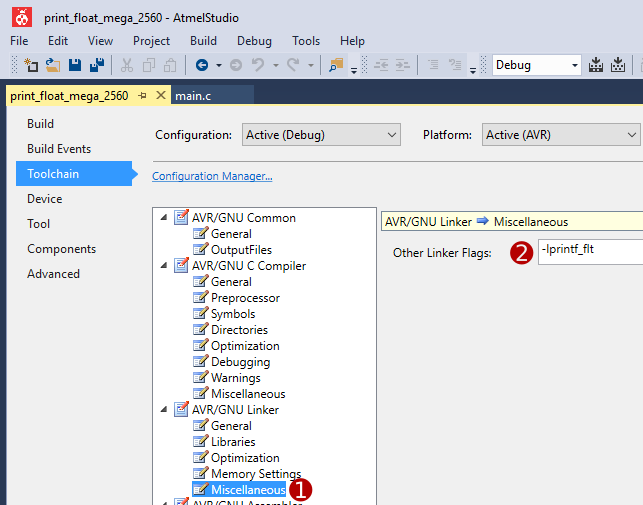 Click Toolchain in the page at the left of the project properties page and then General under the AVR/GNU Linker item as shown in the image below. Finally check the Use vprintf library(-Wl,-u,vfprintf). Now click Miscellaneous under the AVR/GNU Linker item and add the following in the Other Linker Flags box as shown in the following image. Save the changes to the linker options (Ctrl + S) and then rebuild the project. Projects that use sprintf and printf type functions should now be able to print floating point numbers to strings or standard output. -Wl means that linker options follow with each linker option separated by a comma. -u forces linking of library module that follows it. vfprintf function which is used by printf type functions. Used with the -u option forces the linker to link this function from the library which is necessary to use printf(), sprintf(), etc. -lprintf_flt means that the full functionality including floating point conversion will be enabled for printf type functions.